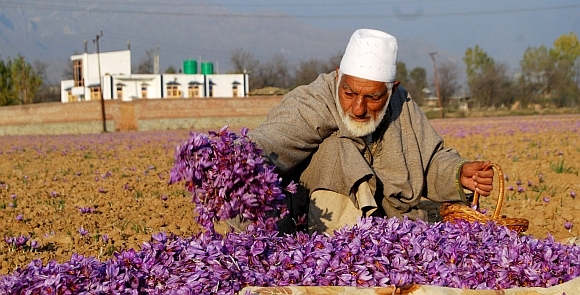 Corms of Saffron, the world's costliest spice (at Rs 1,050 per gram) are these days in full bloom in the highlands of Pampore, a town 14 kilometres south of capital Srinagar. Mukhtar Ahmed reports. The purple flowers impart a mesmerising vista to the vast expanse of Saffron fields on both sides of the Srinagar-Jammu national highway, enlarging the list of tourist attractions in the valley -- 'the paradise on earth'. 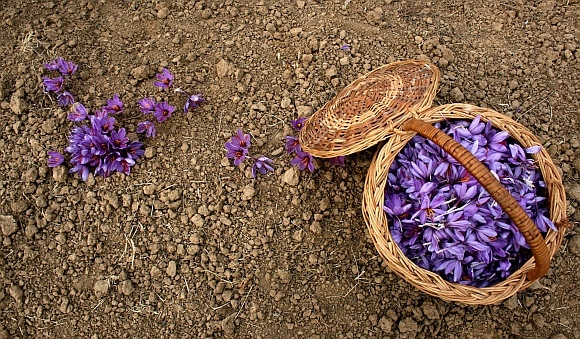 As the royal Chinar trees turn crimson and start shedding their leafy apparel with the onset of autumn, the uplands of Pampore come alive with the violet blossom of Kashmir's unique agri-product, the famous Saffron, reckoned as the priciest spice in the world. Termed an aphrodisiac, colouring agent, spice and flavour, Saffron has been grown on well drained highland fields in Pampore since ages. The crop comes to flower by the end of October and is in full bloom by the beginning of November each year. The spice which comes from the male portions of the bisexual flowers is carefully picked and later sun dried. The high quality of the spice is ensured by picking and drying just the tops of the male portions of the flower. Adulteration of the crop is done by mixing other parts of the flower with the male portions. 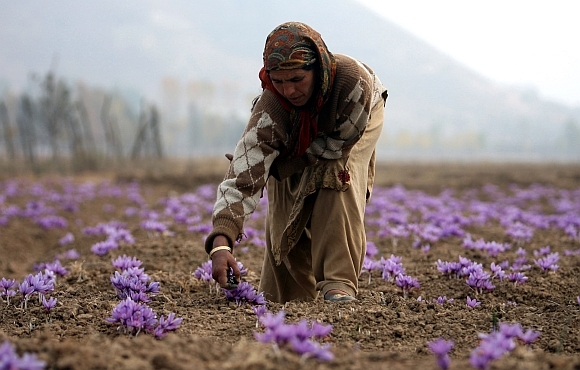 For the last decade, Kashmir Saffron has suffered in international markets because of competition from Iran. 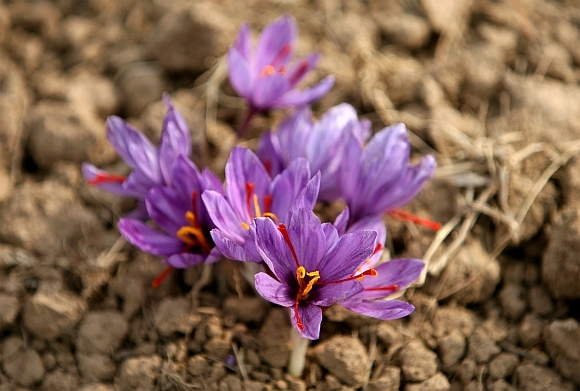 But local Saffron growers believe Iranian Saffron is no match to the high fragrance and quality of the local spice. The production of Saffron has been increasingly confronted with other challenges of dipping growth and shrinkages in its area of cultivation even though the State government has already enacted a law banning constructions on the Saffron land. in order to protect the saffron industry, the Central government announced the 372.18 crore national Saffron mission two years ago. Through this ambitious programme, growers are provided credit for digging bore wells, buying better quality corms and creating scientific crop cultivation facilities. 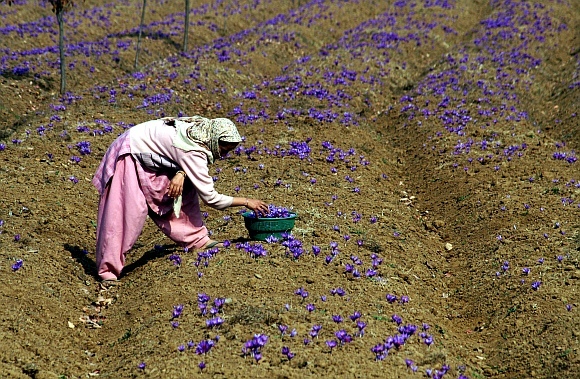 Farooq Ahmad Lone, director of agriculture, told rediff.com that the production of Saffron cultivated on 3785 hectares in the Valley is estimated at around 11 tonnes this year.